Veggie Hummus Flatbread is a semi-homemade meal of seasoned toasted flatbread covered with hummus and fresh flavorful veggies! Throw together this easy recipe in less than 30 minutes for a light and healthy vegetarian lunch for one or two. 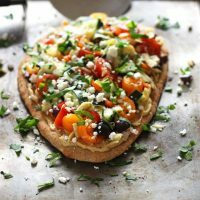 Seasoned naan flatbread smothered in creamy hummus, topped with fresh veggies and a sprinkle of feta cheese…Yeah, let’s do this! Start by taking your whole wheat naan from a soft chewy mass to a crispy on the outside – pillowy in the middle pizza crust by giving it a quick bake in the toaster oven. Pre-made flatbread can be a little bland. Brushing the naan with a little olive oil and sprinkling on a bold seasoning like za’atar* before baking you can add a punch of flavor to your plain store-bought flatbread. Plus it makes the kitchen smell fantastic! I tend to treat every instance of filling, stuffing or topping something like I’m at Chipotle trying to get as much as possible to fit into the tortilla. Then I go to cut my loaded-up item and inevitably get it everywhere. When we first tested this recipe I had written it for double the hummus and veggies. So, of course, there was hummus and cucumbers all over the place. After reducing the amounts and trying again we found the key to keeping topping-loss to a minimum is chopping the veggies into smaller pieces. This way most of them have contact with the hummus and stay put. The ingredients list may seem a little long but trust me it’s worth it. Using small amounts of different veggies brings more flavor and textures than just one or two would. Sweet grape tomatoes balance the salty Kalamata olives. While crunchy cucumbers and mini bell peppers contrast the meaty artichoke hearts. And the best “cooking for two” onion, the mighty shallot contributes a little bite. I understand most vegetables aren’t usually sold in these small quantities. If you don’t have a use for leftovers like a whole jar of Kalamata olives, can of artichokes or basket of grape tomatoes get your veggies from the salad bar like Beth from Budget Bytes does. And for a more filling lunch, you can add a cup of soup or indulge in a sweet small batch treat like these Toaster Oven Double Chocolate Cookies. Got a group to feed? 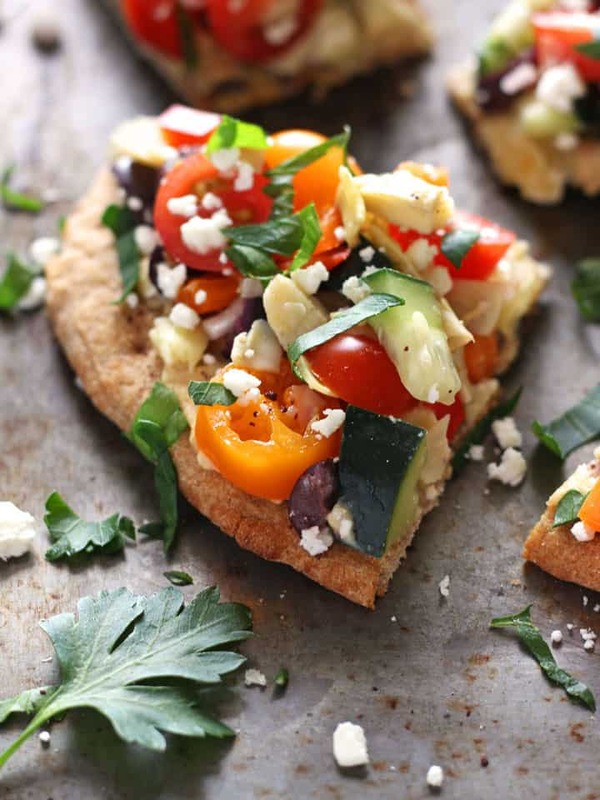 Add a batch of our Veggie Pita Pizza Bites, Chickpea Cucumber Mini Pita Pizzas, Addictive Roasted Sweet Potato Rounds or easily double this Veggie Hummus Flatbread recipe for a crowd-pleasing fresh and healthy Game-Day appetizer! 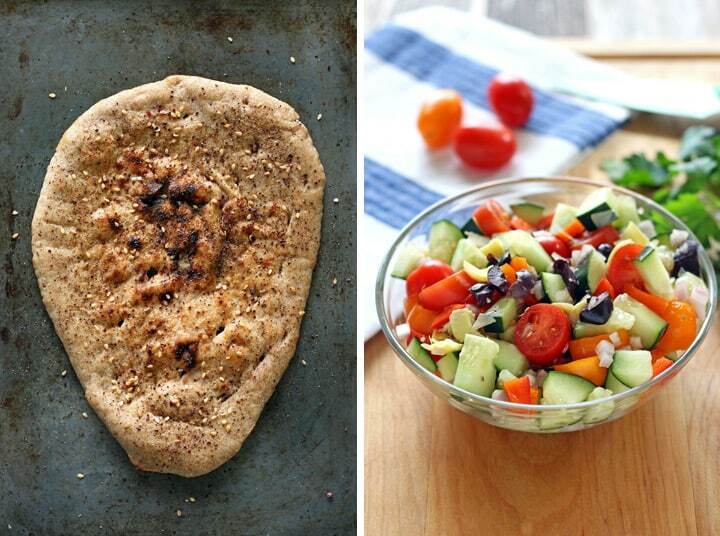 Delicious whole wheat naan topped with protein rich hummus and flavorful fresh veggies. A perfect quick and healthy lunch for two. Preheat toaster oven or oven to 400 F.
Place flatbread on an ungreased cookie sheet and brush (or spray) each side of flatbread with oil. Sprinkle with 1/2 teaspoon Za’atar seasoning. Bake flatbread at 400 F for 7 to 8 minutes until golden and crisp on the edges. Allow flatbread to cool 3 to 4 minutes before topping. 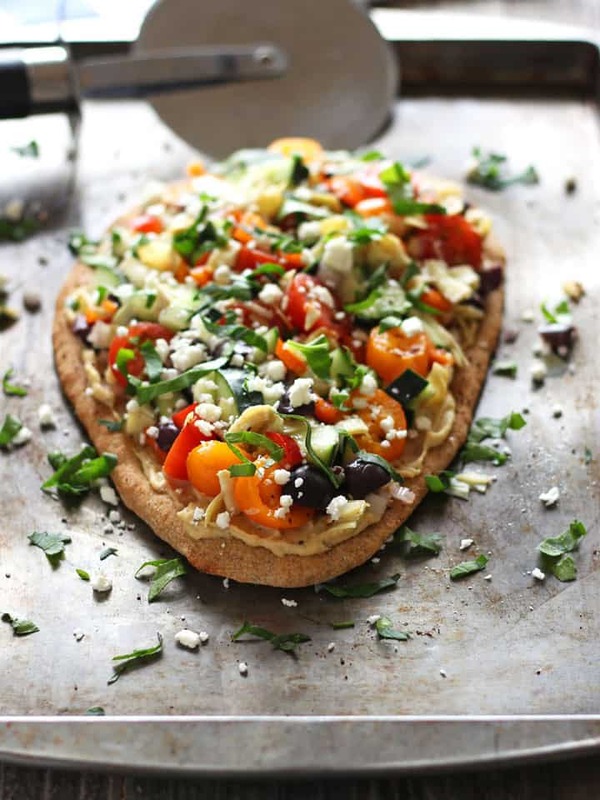 While the flatbread cools mix together the artichoke hearts, Kalamata olives, tomatoes, cucumber, bell peppers and shallot in a small bowl. Drizzle with the lemon juice and add remaining 1/4 teaspoon Za’atar seasoning. Stir well to combine. 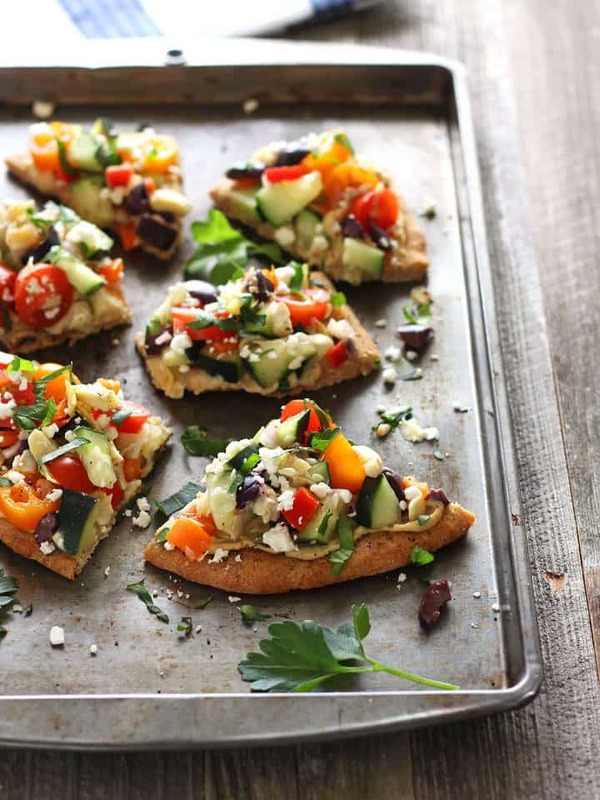 Spread cooled flatbread with hummus and top with chopped vegetables. Sprinkle with parsley and feta. Use a pizza cutter to easily divide into six slices and enjoy. 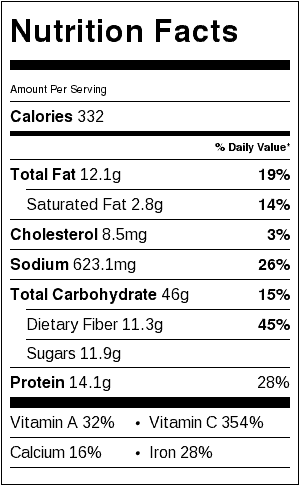 Nutritional information is an estimate for 1/2 of the topped flatbread. *Za’atar is a Middle Eastern spice blend. Some grocery stores like Whole Foods carry it (although we had trouble finding it locally ourselves) but you can also purchase it from Amazon or make your own with this recipe from Bon Appétit. You can also substitute Italian seasoning or your favorite spice blend. Seriously, this is so much better and healthier than a pizza! I want this for my lunch! This sounds and looks amazing, I have never seen Za’atar before so will need to look into that. Love your photography! I hope you get a chance to try some Za’atar, it’s such a delicious spice blend and tastes great on everything like hummus, scrambled eggs, roasted veggies…. Aww thanks Jessie 🙂 I hope you enjoy the recipes.